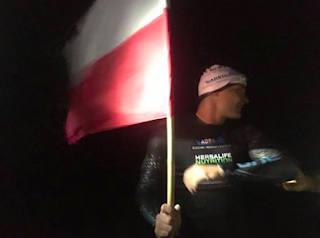 Sebastian Karaś has been building up to his 100 km Baltic Sea swim for several years. He competed on the FINA 10K Marathon Swimming World Cup circuit for a few years and twice did the 19.5 km BCT Gdynia Marathon in his native Poland beginning in 2012. Then he completed a fast 8 hour 48 minute crossing of the English Channel. His pool training took on longer and longer challenges. He first completed a 12-hour charity swim in a 25m pool where he swam a total of 55,600 meters. Then his final long pool workout before his Baltic Sea swim was another 24-hour charity swim in a 25m pool where he swam 96,850 meters. He needed each and every meter and every hour of that 5-year training program. And it showed over the last 24 hours. He walked up on shore safely and successfully today after his 28 hour 30 minute 100.8 km sea swim from Kolobrzeg, Poland to Bornholm, a Danish island in the Baltic Sea off the south coast of Sweden in 17.5°C water. His journey also required patience and a deep commitment. "This swim was Sebastian's third attempt this year," reported Roman Karbownik. 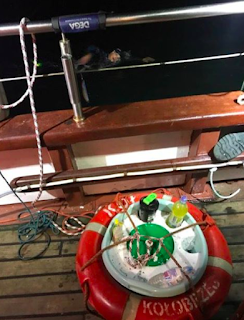 "He and his crew traveled to Kolobrzeg twice in July and August. Because of the weather we had to delay start twice. It was real nerve-racking especially for Sebastian. On his last, third attempt, it was quite difficult to bring a complete support crew to Kolobrzeg." His 100.8 km journey is described and shown here on his Facebook page describing his charity swim on behalf of Magda Samoraj.